Clients often ask their advisors about private foundations. 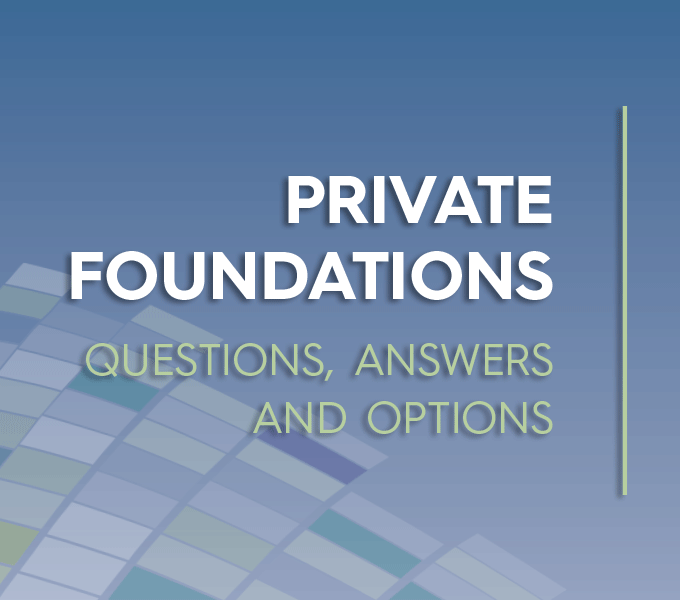 CCF’s Private Foundations: Questions, Answers and Options brings together detailed white papers addressing the major questions and issues faced by clients throughout the life-cycle of their private foundations. You can explore the individual white papers below or download the full system here. Advisors choose CCF because of our ability to provide solutions tailored to meet their clients’ specific needs. Drawing on our 100-year history and expert staff, we help advisors and their clients transform generosity into impact in Los Angeles, throughout the country and around the world. To learn more and discuss how CCF can help you and your clients, contact us. People who consider a forming a private foundation do so for many different reasons. When evaluating whether a private foundation might be right for your client, there are many considerations, ranging from selecting the assets that will be gifted to discovering the client’s appetite for administration and method of making grants. Knowing what questions to ask can help you determine whether a private foundation is the best option or, if not, what alternatives might better meet your client’s goals. Why does your client want to form a private foundation? What assets will be used to make the gift? Does your client feel comfortable investing as a fiduciary rather than as an individual? Does your client know what charities and causes they would like to support? If multiple people are involved with making decisions, can they agree on these issues? How much time and interest does your client have for administrative tasks? Does your client have any concerns with privacy? Who would your client like to serve as successor? Will that person be interested in doing so and aligned with your client’s charitable goals? What are the alternatives to a private foundation? Operating a private foundation allows a client to maintain high public visibility about their charitable work while providing great control over board appointments and investment decisions. But these along with these benefits, private foundations often present clients with various challenges, from tax issues and legal compliance to succession planning and engaging the next generation in the work of the foundation. Operating a private foundation is like running a business. The client must, among other things, hold board meetings, invest assets, review investment performance, vet charities, make grants and review and file returns. Even though the client may hire professionals to help with these tasks, they still have work to do to comply with fiduciary duties and other federal and state rules. As time goes on, clients with a private foundation may find they are exhausted by the administrative burdens or that the challenges of running the foundation are preventing them from making their desired impact. We hope you find this information helpful during your conversations with clients. If you or your clients have questions or would like to discuss further, our charitable giving experts are available to provide you with the answers, solutions and support you need. Please contact us at (213) 239-2310 or tmosqueda [@] calfund [.] org.